Gain new insight into your financial performance with daily reports containing key financial highlights and ratios.The daily dashboard gives executive management up to date data on assets, loans, deposits and any legal lending limits which might be imposed. 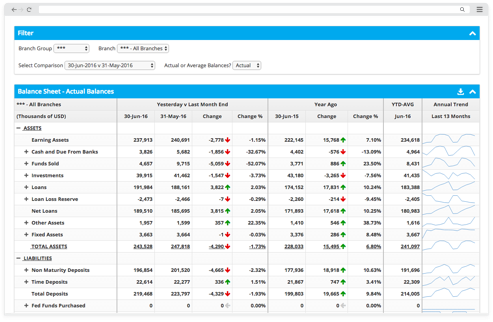 The daily balance sheet provides an easy way to analyse daily movements in loans and deposits. The balance sheet can be accessed at any time from a tablet or phone, greatly reducing the need to ask staff to produce reports. Analyse the daily changes in income and expenses with our daily income statement. It is an easy way for your CFO to track interest accruals and flag any early warning signs that items may have been booked incorrectly. 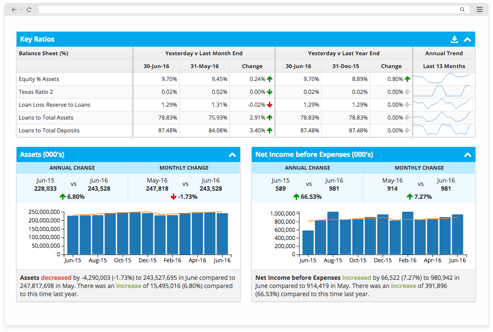 Delve deep into the data with the month-end reports, helping you to track and monitor financial results. Determine financial position and earnings with key financial ratios, balance sheet position indicators and earning indicators. Track key performance ratios which form a key part in measuring a bank’s strategic goals. 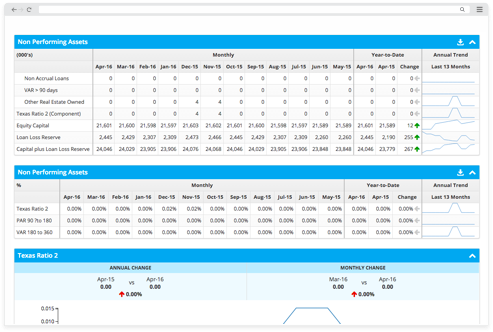 Analyse performance with a financial scorecard v budget, giving you a full comparison of all key ratios against budget. In addition to month-end reports you can achieve a true understanding of financial position with daily balance sheet updates. Daily reports allow you to analyse and predict end of month performance, meaning you can act based on facts rather than hunches. Compare average balance calculations, analyse balance sheet trends, breakdown asset composition, and identify loan and deposit trends with detailed and comparative reporting. Take financial control and identify areas of profitability with comprehensive daily Income Statement. Identify underlying trends, manage overheads, analyse employee productivity, and compare monthly breakdowns with informative and in-depth reports. Equip branch managers with valuable reporting capabilities and track individual branch performance with branch reporting. Take advantage of expense vs budget tracking, balance sheet analysis, and loan and deposit analysis at a branch level, with local branch reporting. Gain new insight into financial health and track asset and investment performance using yield and margin reporting. Margin analysis comparisons displays the yields for investments and loans and the cost of funds for demand and term deposits. Track the yield on earning assets, interest income yield and net interest margin over a twelve-month period with powerful trend analysis. 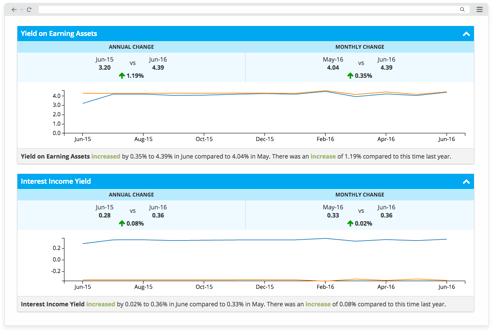 Monitor financial performance and identify at-risk portfolios with past-due asset analysis. Examine non-accrual loans with past-due days analysis, calculate loan loss reserves, breakdown the portfolio at risk and the current reserve put aside to cover future loan losses. 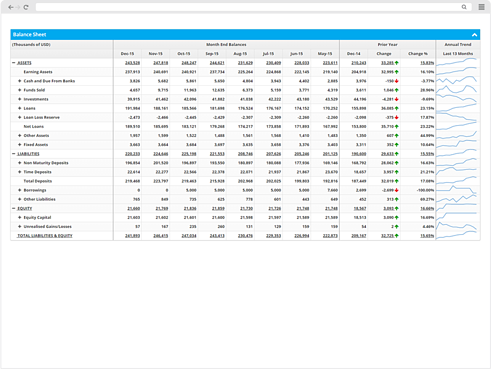 With our drill down analytics you can measure any key performance indicator, financial ratio, balance sheet line or income statement line, monitor the underlying trends to see why that indicator has moved up or down, and manage your plan in response to the insight gained.